Note: There are two versions of this program on the same DVD: 99-minutes and 52-minutes. In a flash, dramatic images shoot across the planet. They show thousands of carcasses of seabirds and sea otters covered in oil. A thick black tide rises and covers the beaches of once-pristine Prince William Sound. For twenty years, Riki Ott and the fishermen of the little town of Cordova, Alaska have waged the longest legal battle in U.S. history against the world's most powerful oil company - ExxonMobil. They tell us all about the environmental, social and economic consequences of the black wave that changed their lives forever. 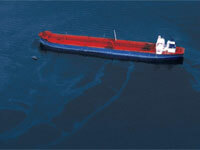 This is the legacy of the Exxon Valdez. Note: An excellent 20-page Teaching Guide and a 6-page Student Guide, both by Riki Ott, PhD are available. "Black Wave is a stunning reminder of the havoc wreaked in Prince William Sound by the grounding of the Exxon Valdez, both on one of our nation's most beautiful waterways but on the lives of the people living there and the wildlife so essential to the area's beauty and economic life. It also makes graphic how Americans are at the mercy of large corporate entities who wield enormous power in our society. As someone who has been a lawyer and a law professor for more than 50 years, Black Wave sadly demonstrates how our civil justice system often falls short in delivering justice in a timely fashion." "For the people of the area, the oil spill was an economic tragedy. A key theme of Black Wave is that enacting and enforcing environmental laws and regulations is good for the environment and the economy...Consequently, the film is appropriate for environmental courses focusing upon natural resources and environmental policy. The spill was made worse because Exxon was not prepared to respond to a major oil spill. Thus, the film could also be shown in a course focusing upon emergency preparedness." Professor Browne Lewis, Cleveland Marshall College of Law, Cleveland State University, Author, It's Been 4380 Days And Counting Since Exxon Valdez: Is It Time To Change The Oil Pollution Act of 1990? "The Exxon Valdez oil spill is a gut-wrenching story on several levels, but nowhere as much as on the human level - and that is the focus of this film. It tells the story of how our legal system is simply unable to respond to an ecological disaster that causes profound and widespread, but often intangible and indirect, harm to a community. The moral of the story is that the only way to deal with an oil spill like this is to prevent it from occurring in the first place." "Black Wave comes at just the right time: to remind us why oil drilling won't solve any of our problems, and to incite anger and action in response to the impending devastation along the Gulf Coast." "Highly Recommended. In light of the most recent calamity, the BP spill off the Gulf of Mexico, this film is both chilling and alarming...Eighteen years after this disaster, there is still oil present in Prince William Sound. The townspeople attest that Exxon officials lied to them. They promised to make them whole again...The local people have lost faith in the government, corporations, justice and the court systems...This film would be useful for discussion in high school and college classrooms." "Timely...Disheartening and sadly relevant, this cautionary tale...is recommended." "A commanding investigation...especially pertinent...Classes across the curriculum can utilize this program, and it should be included in all library collections." "Black Wave masterfully integrates original news footage, shocking statistics, and personal testimonies to produce a powerful indictment of corporate greed and irresponsibility. Robert Cornellier lays bare ExxonMobil's hypocrisy by exposing 20 years of tactics geared solely at avoiding responsibility for the worst environmental disaster in North American history. Meanwhile, the townspeople of Cordova fought and lost against ExxonMobil in the longest legal battle in US history, while the oil giant's annual profits rose from $5.2 to $40.6 billion. The verdict: in a world run by multinationals, citizens are on their own."